*Heat oil in a saucepan and fry chopped onion for 2 minutes or until it becomes tender. *Add minced chicken and sauté for 5 minutes or until tender. Add mushroom slices and sauté for 2 minutes. Add MAGGI Secrets Bolognaise Mix and water. Bring to boil with constant stirring then keep on low heat for 10 minutes. Set aside. *Mix milk with MAGGI Secrets Béchamel Mix. Bring to boil with constant stirring then simmer on low heat for 2 minutes or until sauce thickens. Set aside. Start with a layer of béchamel then a layer of lasagna. Add half of the portion of the chicken bolognaise mixture then again a layer of lasagna. 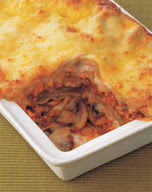 * Add the remaining portion of the chicken bolognaise mixture followed by a layer of lasagna. *Finally top with béchamel sauce and sprinkled Mozzarella cheese on top. *Bake in a 180˚C oven for 25-30 minutes or until the surface becomes golden in color.